Heat a small pan addfew drops of oil and add washed shrimp and pinch of haldi. In another pan add 1 sp oil and washed gongura and green chillies, cook till the leaves change color and let it cool. Now make a paste of cooked gongura and green chillies, add water if required. Heat a presser cooker and add oil. Add salt and cook till onions are brown. Add the cooked shrimp and saute for few mits. Now add gongura paste and mix well. Add 1/2 cup water and presser cook. Remove lid and cook further if any excess water is leftout. Clean fish and apply little haldi and keep aside. In asmall pan add 3 sps oil and fry fish on both sides for 2 mits. 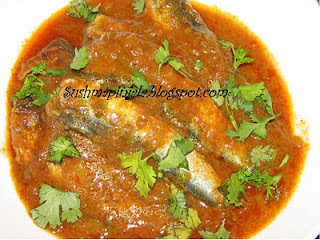 This process is done to avoid the fish pieces to break while cooking in the tamrind sauce. In pan heat oil and add chopped onions and saute for few mits. Now add chopped green onions and green chillies. Fry till onions turn golden brown and add haldi, salt, chilli powder, cumin and dhaniya powder. Mix well and add tamrind juice. Now cook on medium flame till oil appears on the top of juice. Now add fish pieces and cook for 8 to 10mits. on low flame. Do not turn the fish pieces, they tend to break easily. Before turning off the flame sprinkle little garam masala on top and mix gently. Heat pan and add little oil, add sesame seeds 1 onion chopped, peanuts. Fry them and grated coconut. Fry till coconut changes its color to brown. Switch off flame and let it cool. Now grind this with tamrind pulp and ginger garlic paste to smooth paste. In a large pan heat oil and add chopped onions, fry for few mits and add the masala paste. Cook till bubbles appear and add the cut veggies, aloo, carrot and baby onions. You can use any type of veggies u want. Add salt, haldi and chilli powder. Mix well and add yogurt. Saute for some time and add 1 glass water. Cook on medium flame till all the veggies are cooked and oil separates. China grass is usually found in chinese markets or chinese food section of any grossery store. It looks like in the below picture. In alarge sauce pan mix milk and water and bring it to boil. Meanwhile cut the china grass to small pieces. Take 1 cup of hot milk which is boiling in the sauce pan to another bowl. Mix all the china grass which is cut to small pieces in to the 1 cup milk. Let it set for 5 mits and grind it to smooth paste. Now add sugar to the boiling milk on the stove. Now add the paste also to the boiling milk. 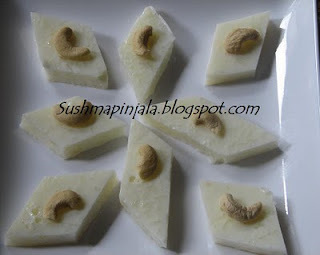 If u want u can add the dry fruits of ur choice now it self. Other wise u can add up later also. Take 2 large plates or trays which had 1 inch depth. Grease them with oil, ghee or melted butter. Switch off flame when the mixture comes to boil. Immediately transfer the mixture to the greased plates or trays. 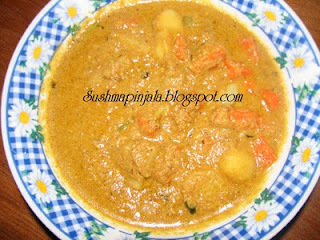 This is one of the North Indian dishes which my hubby likes. I am not soo found of this as i dont have curd at all. Sending this recipe to Indian Cooking Challenge Sep 2010. Beat sour curd throughly and add 4cups water and mix well. In a small bowl add some hot water and 2 sps of besan and mix well. Now add this besan mixture to the curd mixture. Switch on stove and let this cook on low flame. Meanwhile heat another pan and heat oil for making tadka or tempering. Now add curry leaves, jeera, mustard seeds, udad dal, red chilli, green chilli, chopped onions, methi seeds. Heat oil in pan and add curry leaves, chopped onions and green chillies. Saute for few mits and add ginger garlic paste. Cook till raw smell of ginger garlic paste dissappears. Now add salt, haldi chilli powder. Mix well and beat eggs. 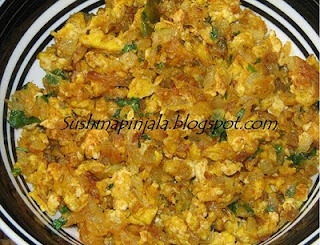 Mix all the beaten eggs well with onion mixture. Put flame on low and cook for 5 more mits. Now add chopped cilantro adn serve hot with rice and roti. Gongura is tangy leafy vegatable. It is widely consumed in Andhra pradesh. 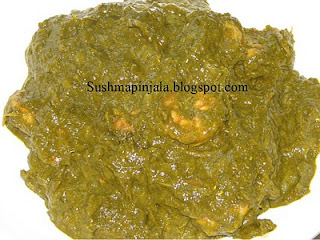 It is also know as Puntikura in some parts of Andhra pradesh. Gongura is very rich sourse of vitamins, iron, folic acid and anti- oxidants essential for human nutrition. It is highly recommended for diabetes and heart patients to maintain their diet. It is called as Pulichakeerai in Tamilnadu, Ambaadi in maharasthra, Pitwaa in Oriya, Mestapat in Bengali, Pandi in Kannada and Sorrel leaves in English. 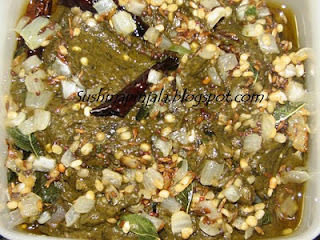 Gongura can be cooked in many ways, some cook with meat, shrimp, lentils or as chutney. In a small pan heat 1 spoon oil and add throughly washed gongura leaves, tamrind, chopped green chillies and 2 garlic cloves.